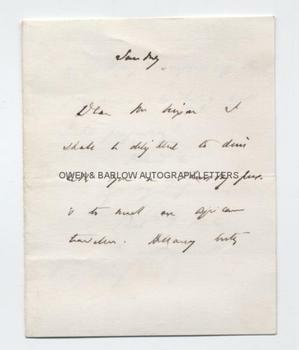 SIR RICHARD FRANCIS BURTON Autograph Letter Signed. ALS. 2pp. No place. Sunday. No Date. To D. de Corry (?) Nixon. 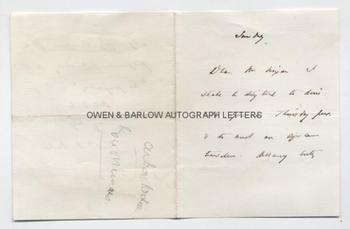 Burton's spidery handwriting is somewhat difficult to decipher but appears to read "I shall be delighted to dine with you on Thursday next and to meet an African traveller. Allowing . . . (?) a flattering description of that particular entity (?) and "no prejudice". 16mo. 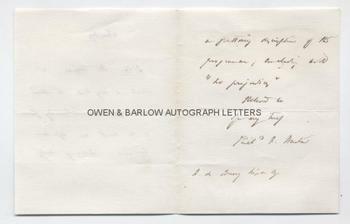 Approx 4.5 x 3.75 inches. Very slight mounting traces to verso. Fine. Sir Richard Francis Burton was one of the most colourful characters of the 19th century. With John Hanning Speke he made explorations in Africa of the Great Lakes and in search of the source of the Nile. He is also noted for his pilgrimages to Mecca and Medina and for his translation of the Arabian Nights.